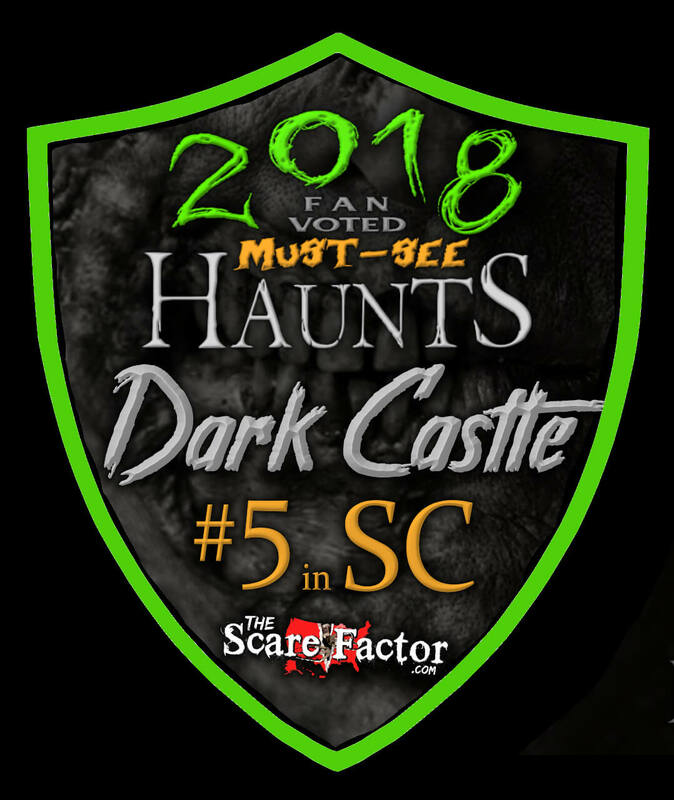 Team Jefferson Starship reviewed this Haunted Attraction on September 28, 2018. The Dark Castle, outside of Elgin, SC, was formerly known as the Dark Knight’s Terror Trail. However, as the haunt complex has grown, adding more and more pieces to entertain and amaze, so too has the name changed. Now, the Dark Knight’s Terror Trail is simply the name of the outdoor trail that winds through the back of the haunt around the southern woods, through visions of the macabre, the strange and the surreal. The indoor haunt is now called the Dungeon of Darkness and the outdoor/indoor zombie hunt is simply known as the Zombie Zone. But, that’s not all! The Dark Castle complex also houses a pair of 5-minute escape rooms (Brisk Breakouts) and a Break Room where you can smash a variety of things to let out your aggression. 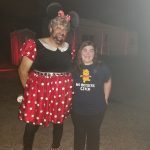 The Escape Rooms and Break Room do carry an added cost but if you’ve got the time and the money, you can easily spend an evening at the Dark Castle taking time to do everything or to tailor your visit to your specific tastes. 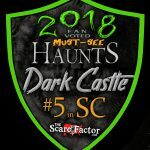 Let us say, first off, that the Dark Castle is an experience unlike any other in South Carolina. The time you will spend here is full of entertainment surrounded by friendly (and creepy and spooky) people. 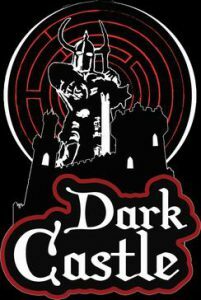 Think of Dark Castle as a horror comedy along the lines of “Tucker and Dale vs Evil” or “Murder Party” as opposed to a slasher flick like “Texas Chainsaw Massacre” or splatter like “Saw.” At the Dark Castle, the scares are the punchlines to the jokes, puns, and occasionally bawdy wit on display from the guides who take you through each of the three main attractions. That said, the experience is definitely PG-13 – if you bring along young children (say 10 and under), they should probably focus on the Zombie Zone and Brisk Breakouts. Throughout all of the haunted attractions, you will have a guide with you at most times either right by your side or at least close by. The guides are all on point and amazing – from the booming voice of Maxi Mouse to the calm instructions of Mike and the dark allure of Rigg, Pandora, and Psycho, you can count on these guides to provide an entertaining night. The Dark Castle is full of characters. Some of these are recognizable icons of classic horror movies or modern pop culture and whether they all float or turn things upside down, they are playful and on point, never breaking character. There are tons of things to see with custom props on display built by some of the full-time cast and volunteers. The actors work well with their surroundings, making each scene unique and special. We not only reached into Pandora’s boxes, but we also got tickets to the fair and got to hold Georgie’s sailboat, however, briefly. 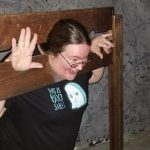 The cast inspired several other interactive moments with our group as well, whether they be props handed to us by one of the costumed haunters, or being part of the display itself by getting locked in the stocks or strapped to a rack. The costumes at the Dark Castle are amazing. Many of the costumes seemed to be individually tailored for the specific haunter as most of them seemed to be well fitted. Additionally, they are all appropriately either distressed or pristine as the character demands. On our visit – opening night of 2018 – the temperature and humidity were both fairly high. In a few cases, the heat and humidity were working against the make-up, but despite that much of the make-up and all of the costuming were well done. The clown tent, in particular, should not be avoided (as if you had a choice!) because each of their clowns has a distinct personality, actions, attire, and face. GPS will take you right to the door of the Dark Castle, sequestered among the dark trees of South Carolina. Their website has tons of information – from address and email, to online ticketing. Staff continually roam through the large waiting area between the attractions, always willing to help out, ready to make sure you get to where you’re going next. They are all super-welcoming, helpful, and enthusiastic. The non-costumed staff will gladly point things out and answer questions. The costumed haunters stay in character for all interactions – so if you spot one crossing the central yard, be sure to shout out their name and strike up a (brief) conversation. The atmosphere outside the exterior of the Dark Castle doesn’t completely convey what you are going to experience inside. It is fun and inviting; music is playing and there are wall-projections and lights, all in the shadow of the looming castle walls. Inside the courtyard, however, the anticipation builds. Here you can find a number of coffins as seating around a firepit, horror movies playing in an indoor waiting area, and the occasional costumed guide passing from place to place. The courtyard also features Nana, a matron willing to pass the time talking or telling ghost stories on request. Screams from the darkened woods beyond the courtyard and the roar of engines inside the Dungeon meet in this waiting area, heralding the horrors within. There are lots of well-made sets and props at the Dark Castle, many of them unique and made on-site. There are tons of pop culture references scattered around as well; from It to Stranger Things to Doctor Who to American Horror Story – you just have to keep your eyes peeled and look at everything around you. Inside the ‘Dungeon of Darkness,’ you’ll find several of these custom-made props – be sure to look around the Curio Room and the Hoarding Room for what might be sitting on shelves or waiting with open hands. There is a little bit of sound-bleed from the louder rooms of the Dungeon, but that just helps ramp up the anticipation of what might be coming next. The ‘Terror Trail’ has a lot of custom sets and surrounding props that the actors use to command attention and scare you on your way. The woods are scary, dark, and deep, so be sure to stick close to your guide. The Zombie Zone stretches from outside to indoors. Though it may seem sparse, the growing hordes of zombies serve very well to focus your attention on what you need to do to survive. It is worth noting that the Zombie Zone is, on some nights, populated by volunteer zombies from different organizations as a fundraising event. There is not a single over-arching theme for the Dark Castle. 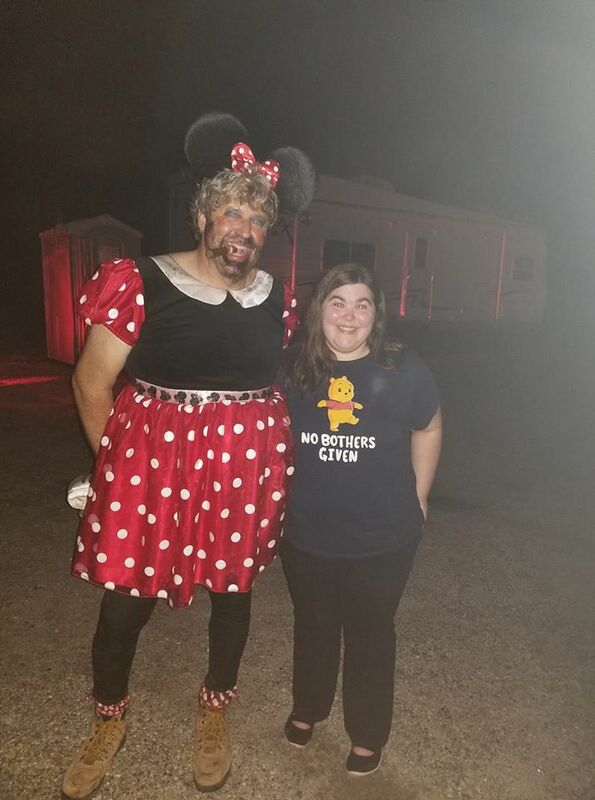 As they note on their website, “not everyone scares the same.” As a result, the whole place works to entertain guests, hitting a wide variety of different things so that while you might be terrified in one scene, you’ll easily be laughing in another, or finding yourself part of the entertainment in a third. Scares come at you from a variety of angles here, with each of the attractions focusing in slightly different ways. Though all of them work to provide scares to the whole group, they do this in a variety of ways. Along the Terror Trail, while much of the vocal interaction is geared towards the front where your guide will be, scares can pop out from anywhere around you. In the Dungeon, many of the scares are aimed at the front of the group, but there are a few rooms that shuffle your group dynamic and remove any concept of “front or back.” And, of course, in the Zombie Zone, the zombies seem to start out being solely behind you, shuffling along, but eventually will reach such a mass as to nearly overwhelm even larger groups, sometimes even turning your fellow guests against one another by turning them into zombies as well. As we stated above, many times at the Dark Castle, the scares are the punchline to the jokes and humor of the evening. Distractions are par for the course; the guides may get you looking one way while hidden monsters are coming up from behind. As you can choose the order in which you do each of the attractions, each one has its own different finale. From the standard southern haunt chainsaw chase ending to a choice of fated doors to the heart-pounding “Zombies! Run,” each of the haunts has its own way of ending on a breath-stopping finale. The Dark Castle is a lot of Halloween bang for your buck. Their pricing is structured so that you can choose which attractions you want to do, with ever increasing discounts for how much you want to do. A single one of their haunts is only $13, but you can hit all three for $30 – a price comparable to many of the larger haunts in the state. The large, outdoor waiting area includes a concession stand and (when the weather is cool enough) a large fire pit where you can sit and trade stories. Feel free to ask Nana for a ghost story if she’s haunting the fire pit or concession stand. Too, there is an indoor waiting area with chairs and a movie playing. Space at the Dark Castle is at a premium – though there are some transition spaces on the trail as you move from one scene to another, the whole area is full of things to see. Inside and out, the guide filled anything that would resemble dead space with witty banter and bawdy jokes. The outdoor courtyard between the attractions could use some queue actors, additional decor, or even facades, but it is unlikely you’ll notice the lack as you’re entertained by the surroundings and the crowds of guests running from each of the exits.